Introduced from England in 1939, this rose offers a pleasing strong tea scent from apricot colored blooms. Growing as a shrub it is ideal for many areas. From 1853 a rose of deep color and bushy growth. Can be used in partial shade. A Ralph Moore introduction from 1971. Blooms start out a brilliant white fading to a soft green. Very generous in the number and frequency of blooming. Grows to a height of about 18". Makes a great border plant. Bred in 1984 with a lemon fragrance. This variety is nearly thornless. Bred by David Austin in 1989, this flowers in an inviting form that invites your nose in to enjoy a wonderful scent. From 1842 and nearly thornless, this rose displays a glossy true pink blossom. Dark green foliage. From 1851 this deep pink bloomer will delight you with the change in shading through the seasons. From France, this 1888 rose has a strong fragrance with very large flowers. This plant should not be pruned. Can be trained as a pillar. From 1851 this bourbon will flower in clusters with full blooms. The soft pink glow is very pleasing to the eye. Frequent re-blooming is another appreciated characteristic of the variety. 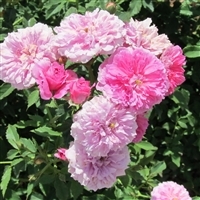 From France in 1881, you will enjoy the raspberry fragrance that this rose offers. The colr varies from deep pink to a shaded purple. A 1930 introduction, the World Federation of Rose Societies named this the World's Favorite Rose in 1997. She has a sweet fragrance. Penelope was introduced in the UK in 1924, she won a Gold Medal at the Royal national Rose Society Show in 1924 and continues to receive awards into this century. Do not prune this rose heavily. An Earth-Kind® rose from the UK in 1928 this is a very generous bloomer. The 3-4' size makes it convenient for many sites. A very reliable variety. Queen Elizabeth was introduced in the US in 1954. She is the winner of many awards, both here and abroad.